Three of the stories in this anthology from Airship 27 have ties to other works. In Bobby Nash's story "Mountain Men of the Lost Valley," X travels to Kiev and sabotages a stronghold where a deadly weapon is being built. In Nash and James Burns' comic book Lance Star: Sky Ranger -- One Shot!, Star's foe Baron Otto von Blood attempts to resurrect the weapon-making project dismantled by Secret Agent X. Kevin Noel Olson's "A Stygian Darkness" pits X against Fantomas, the Lord of Terror created by Marcel Allain and Pierre Souvestre. X also receives some assistance in the story from a man named Dunn, who is Operative 48 for an unnamed agency. This is meant to be the title character of Norman Marsh's comic strip Dan Dunn. 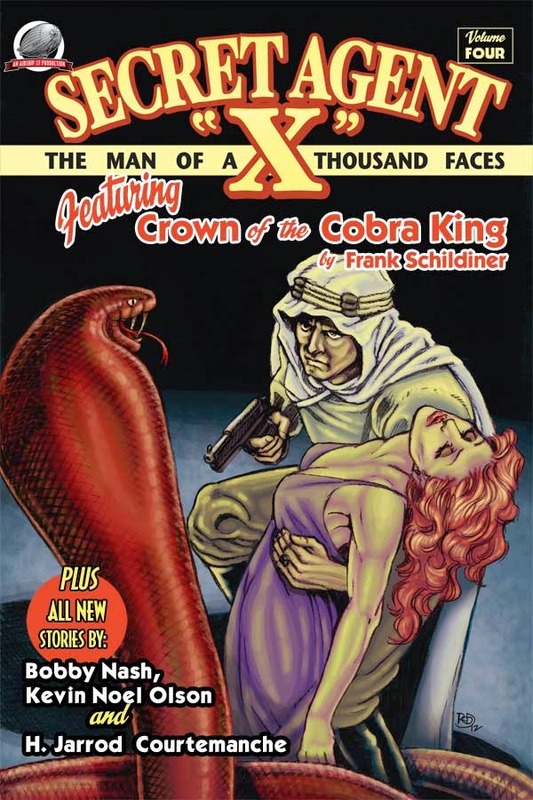 Finally, Frank Schildiner's "Crown of the Cobra King" features worshipers of Father Set from Robert E. Howard's Conan stories as the villains, and also has a reference to Professor Henry Jarrod from the 1953 horror film House of Wax. Thanks, Sean. I love it when I'm able to crossover characters and stories. I do it whenever I can.